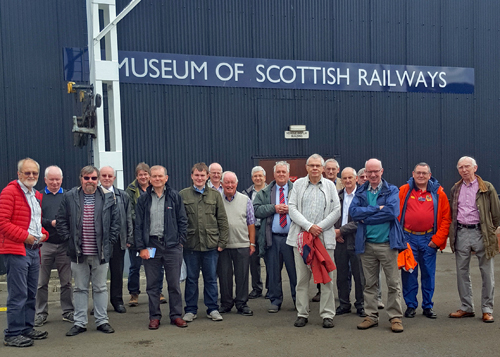 CILT Scottish Region members at Bo'ness. On the outbreak of the Second World War, British locomotive manufacturers could no longer supply an order for 2-10-0 steam engines to Turkish Railways at the original price and conditions. However, Nazi Germany stepped in to offer neutral Turkey DRG BR 52-type Kriegsloks which became the 56501 Class. Diplomatically embarrassed, the British proposed 25 of the LMS Stanier Class 8F2-8-0s, which had been adopted by the War Department as their standard heavy freight locomotive. The engines selected were supplied by the North British Locomotive Company of Glasgow and originally intended for War Department service, but the Fall of France saw them earmarked for the LMS before they were diverted to Turkey. Built in 1942, 45170 has retained some features of her London Midland & Scottish sisters while being fitted with air brakes and right-hand drive. Locomotive 45170 in the museum at the Bo'ness and Kinneil Railway. After the war Turkish Railways found the Class (known as Churchills) not powerful enough for steeply-graded mainline operation, their lack of drop gates also limiting usefulness, so she was deployed on shunting duties and local trip working, becoming a subject of interest to British holidaymakers after the demise of our mainline steam before being stored for twenty years in the desert. Her rescue by the Churchill 8F Locomotive Company Limited along with another went to Israel was the subject of an episode in the television series Monster Moves shown in 2011. Several examples of LMS 8Fs survive in British preservation, and a Turkish sister no 45160 is operational on the Gloucestershire and Warwickshire Railway, while two others are on static display in Turkey. The justification for saving 45170 is that she tells to a Scottish audience a story of wartime cooperation. 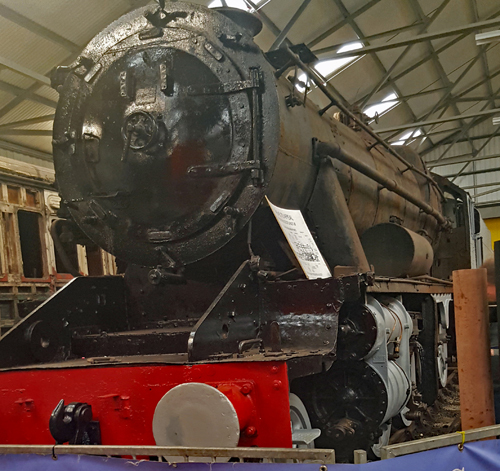 No 45170 is "Scotland's 8F", and an appeal for her restoration has raised over £120,000 in two years, sufficient to achieve purchase, but a total of £350,000 will be required to see her back in steam. SRPS have been able to source and purchase two injectors, and the tender tank externals have been taken back to bare steel, found to be remarkable condition and painted with anti-corrosion primer and undercoat. The Donate a Degree appeal seeks support for new tyres for her wheels, starting with the tender, and splits the £2800 total cost for its six wheels into 360 degrees, working out at £8 per degree. The Scottish Region thanks Mark Adamson for leading the visit and for patiently answering our questions. Report and photographs by John Yellowlees.